This is a sponsored conversation written by me on behalf of Wonderful Pistachios. The opinions and text are all mine. Healthy snacking is what I am all about, specially when it comes to snack at work or in school. 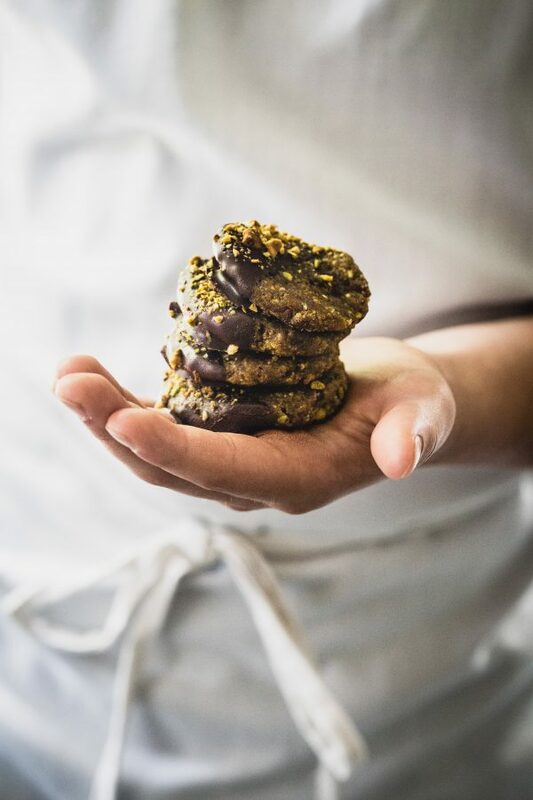 I am the master of trying to keep healthy treats and making sure I come up with new recipes that are tasty, easy and are able to keep me going. 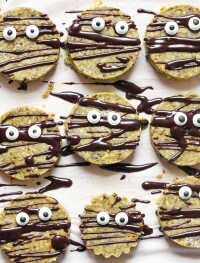 These no bake pistachio cookies are nothing but the prime example. 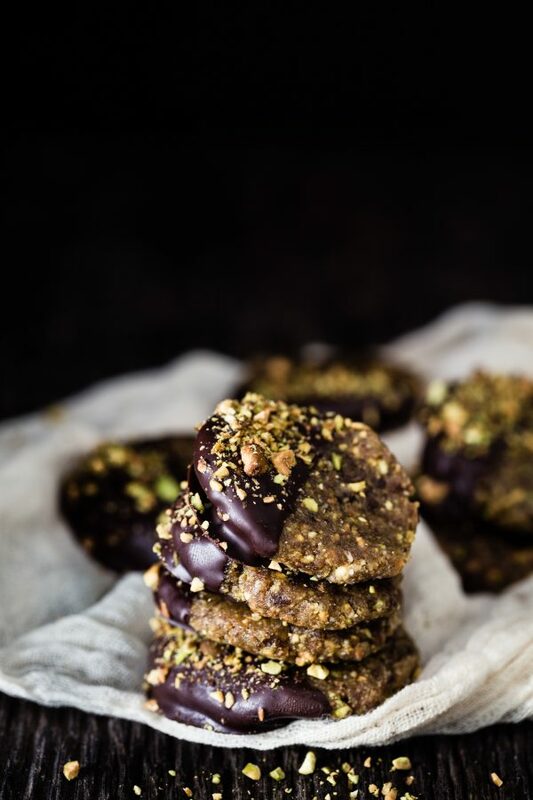 These no bake pistachio cookies not only are extremely easy to make but they are healthy. These are definitely a boost of energy. They are also gluten free and vegan so for those following especial diets this are a great treat. Nuts are one of my favorite ways to snack because they are full of protein, vitamins and minerals. I don’t like to indulge on empty calories so when ever possible nuts are the way to go for me and my family when it comes to snacking. Did you know? 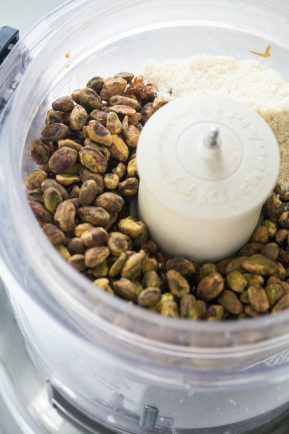 Thirty pistachios are only 100 calories for a snack that offers both crunch and seasoning, making them a satisfying snack choice. Almost 90% of the fat found in pistachios is unsaturated fat, i.e. the good stuff, making them a better snack choice than popular fried snacks foods like potato chips. 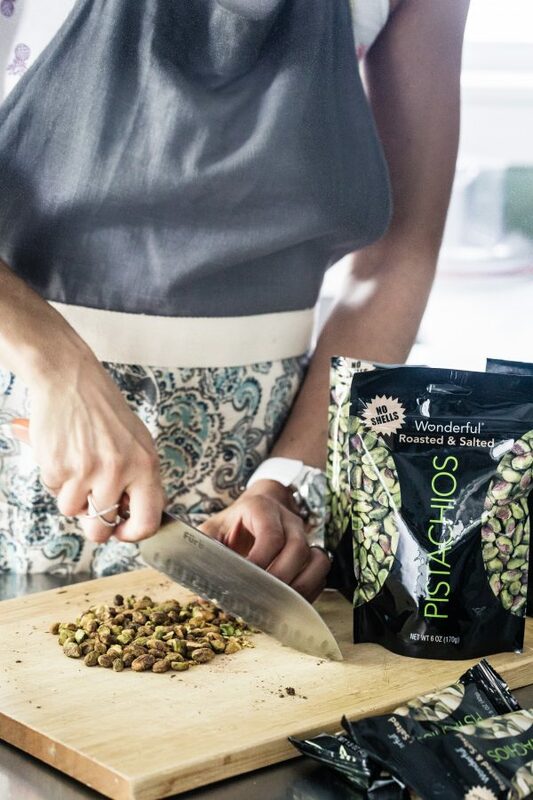 I happen to love Wonderful Pistachios because they are also full of antioxidants. A serving of Wonderful Pistachios provides an alternative to snacks high in added sugars and saturated fat. Load your work snack drawer with healthy snacks, like Wonderful Pistachios. They’re perfect to have when hunger strikes. I also keep them in my kids back pack and my bag to make sure that when ever we get hungry we can have a healthy snack. The little packs are wonderful for this. Snack mindfully with The Mindful Nut. Wonderful Pistachios are the guru masters of portion control. Cracking each shell may help you slow down and savor the moment. So, sit back, relax, and focus on a healthy you. 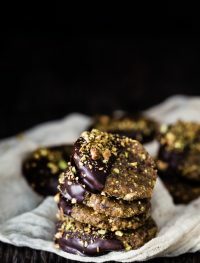 I hope you like this amazing no bake pistachio cookies. 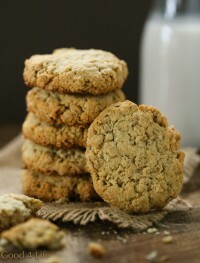 They are super easy, tasty, healthy and great to have around your work station. Line a cookie sheet with unbleached parchment paper and set aside. 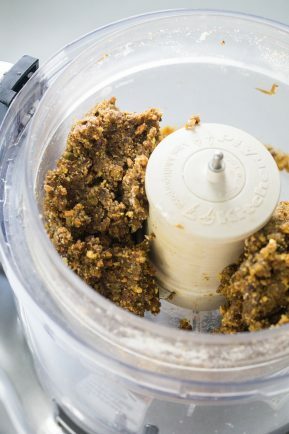 Add the dates to your food processor and pulse until it resembles coarse bread crumbs. Add the rest of the ingredients and pulse until the mixture comes together. 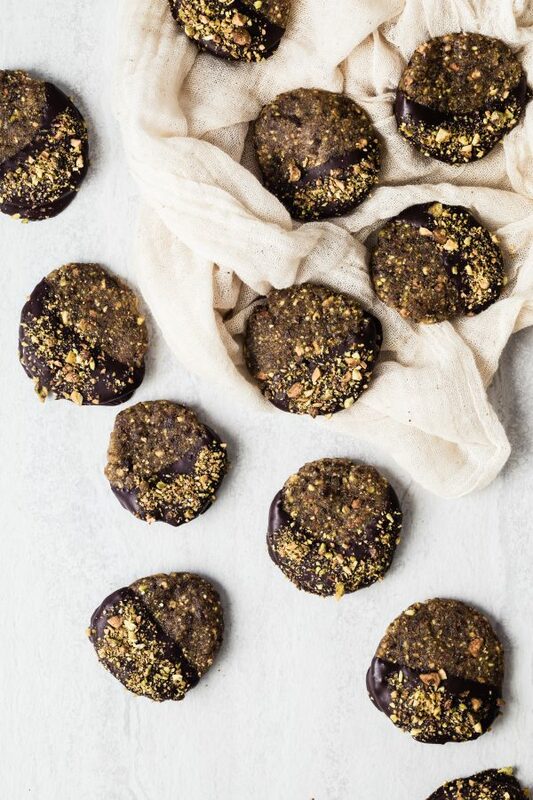 Dip each cookie in chocolate and place in the prepared baking sheet. 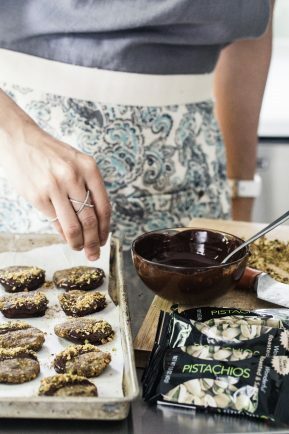 Sprinkle the chocolate with the chopped pistachios. Repeat until you don't have anymore dough. Place in the freezer for about 30 minutes until the chocolate solidifies. Store cookies in the refrigerator. Love that these bars are gluten free and vegan! 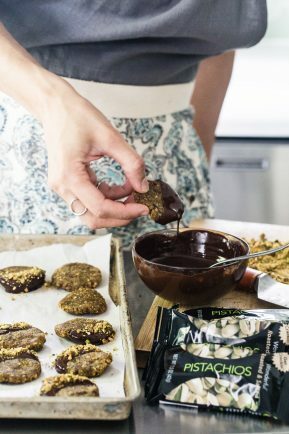 My mom was diagnosed with cancer a few years back and through a holistic nurse changed her entire diet to dairy free, sugar free, gluten free, red meat free and she used to have a HUGE sugar tooth so I’m always on the lookout for dessert I can make for her that still work with her new diet. Think she’ll be thrilled about these! Think subbing agave for the maple syrup would work? Also do you think I could use about half the amount of agave (just to minimize the sugar), just wondering how sweet these are with the listed amt of maple syrup in them? 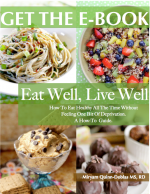 Wow that is a dietary challenge :-) Yes you can use agave and less of it if you like. My bars were OK on the sweet end, not too sweet, but you could decrease the amt further if you like. I hope you like the bars :-) Thanks for stopping by. Love these! Wish I were enjoying one right now! These look fantastic, I love esp. that layer of coconut coffee cream. these look divine! I’ve tried making the nut/date base for other recipes before and the small dates weren’t moist enough to hold it together and it just wasn’t as sweet as when I used the medjool dates. Just wondering which ones you used? Mine weren’t medjol dates but regular dates. I got them while in Spain :-) They are a bit dry that is why I add about 2 tbsp of water to the crust. Thanks for stopping by. Oh wow, these look amazing, Miryam! So chocolaty, rich and decadent. I bet they’re delicious with a cup of coffee! 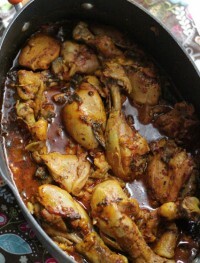 Definitely on my list to make, seems very delicious! Couldn’t find dates, so I subbed dried cherries for the crust and it was the perfect amount of tartness, especially paired with the coffee. Thanks for the recipe! So great! I know this thread is old, but the first time I tried these I had the same problem, was looking great then curdled. But, I just tried using a mixer instead of a blender (what I used the first time) and it worked perfectly! Maybe that would make a difference for you? You can do raw almonds :-) Thanks for stopping by. I also had the problem of my coconut cream looking perfect one second and the next it was all curdled. Do you chill the coconut cream before using? Also approximately how many cups of whipping cream do you get by using 14oz can of cream? I had success in the past using the cream from full fat coconut milk cans so I might try to do that. Thank you, the recipe is divine and I can’t wait to nail it the next time! Hi Lily, I always use the coconut cream at room temperature. I use the trader joes brand. 2 cups of heavy cream would equal the coconut cream can if you like to use that instead :-) I also use the middle layer for this recipe and do frozen popsicles. I just love it. I hope you have success on your next try. Thanks for stopping by! Hi! These sound fantastic but I’m curious. .. is the filling and topping supposed to be in a liquid form before placing it in the freezer? When I was mixing the ingredients in my processor, everything came out in liquid form. I made these and they did not turn out. I had to double the topping recipe to be able to cover the 8×8 pan, and worst of all the filling never became solid. It was a liquid gooey mess, even after being in the freezer more than overnight. I’m wondering if I was supposed to only use the solid looking top in the can of coconut cream? I dumped the whole can in which had a white solid lump followed by liquid oil in the can. Can I substitute coconut nectar for the maple syrup? Can you use regular coffee ground really fine instead of instant coffee? I think it should be good :-) Thanks for stopping by. Any ideas where I can find just coconut cream in Canada? I have canned coconut milk which in the ingredients has coconut milk, water and guar gum listed. Can I use this the same as the coconut cream? 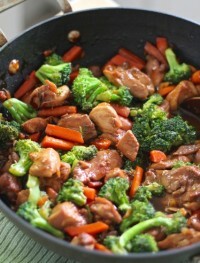 This recipe looks to die for and I’m so excited to make it! Just need to figure out the coconut cream options. Yes you can use that instead :-) I hope you like it! Oh no you too? I think like you mentioned it could possibly be other ingredients in the coconut cream product. 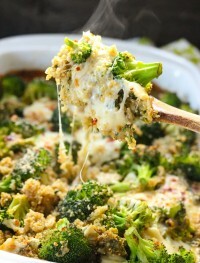 I use the coconut cream from Trader Joes every time I make this recipe but never had such a problem. I was thinking maybe the Irish Cream could prevent the mixture from solidifying it but there is such a small amt in the recipe that I couldn’t possibly think that would be the culprit. Also with your layer being so thin as you mentioned, the quantities in this recipe is what I always use when I make it so not sure about that either. 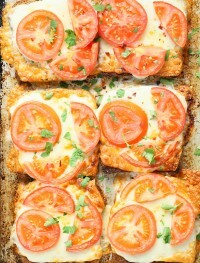 I use a 8×8 square baking pan. I am really puzzled as to why this is not working for some of you :-( Really I wish I could be of more help! Sorry. Love the post, Miryam. I don’t need them to be vegan but the fact they’re gluten free is great for my kids. 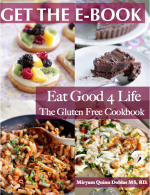 2/3 have gluten sensitivity. Can it be kept in fridge once set and cut up. They kept their shape at moment in fridge. But would say next time I would divide batch in to two tins to keep on in freezer until I needed it. As half of it just right sizes for my family of four. Thanks for letting me know. I really appreciate it. I just made this dessert and it is absolutely delicious! Thank you so much for sharing! I’m in Canada and found Coconut Cream at Walmart. The brand is Savoy, from Thailand and is 70% coconut extract. It worked great! I used Medjool dates for my crust, but it was still dry. Adding a little water did the trick. The more water you add, the more malleable the crust is for moulding into the base of the pan. Instead of regular ground instant coffee, I used Nescafe Instant Espresso. This gave the dessert a stronger coffee flavour and since it’s a fine powder, I had no coffee bits anywhere. When spreading the topping, I found that it hardened quite quickly, so my advice would be to act fast in order to get an even spread. Again, thanks for sharing. This has instantly become one of my top favourite easy-to-make no-bake desserts. … Now I just need to manage my portion control! The saturated fat comes from the coconut in the recipe which has MCT therefore it behaves and has properties very different than conventional saturated fat. This fat is healthy. I suggest you do some research on it!! What to do instead of baileys or kahlua as I am alcohol free? Expresso? A quick point of clarification…I guess this is obvious to everyone but me, but I want to be sure because the difference will matter in how the product turns out. In the “filling” part of the recipe, you list “3-4 tbsp maple syrup.” I assume you mean “3 to 4 tbsp,” correct? (as opposed to 3/4 tbsp) Thanks for setting me straight. I look forward to making this delicious creation of yours. do these need to be kept frozen? I wanted to bring them to a potluck and have access to a fridge but not a freezer? Now there is a VEGAN Baileys :-000 Whole Foods only though…Whoop! Just made this and it has not turned out well. The coffee cream is much too runny even from freezer/fridge and the chocolate topping is much too hard when so cold that it just cracked all over instead of cutting. I’m an experienced cook and don’t usually run into these type of problems. Very disappointing. I have just made these and the centre looks very runny. I’m hoping they turn out after freezing…we will see. I think the issue folks are having may be due to the fat content of the coconut cream used. Brands vary a great deal. For example, the Trader Joes in the US has 9 gm fat per 30 ml. I am assuming that is what you use Miryam. Blue tin? The link to the coconut cream in the recipe has 6gm fat per 30ml. This is a big difference. I would try this brand in Canadian Amazon as it has 4.5 gm fat per 15 ml which is the same as 9 gm per 30 ml like Trader Joes. If the Can is quoting 60 ml serving size you need 18 gm fat. 24 gm fat in 80 ml, or 27 gm fat in 90 ml serving. It totally makes sense. I am thinking people are probably using a coconut cream/milk that is not allowing for the center to be frozen solid. The can I used was dark brown w/ 16 g total fat however their cans have changed now and the one I used is the full fat coconut can which is light blue and the total fat is 9 grams per serving, I don’t know why the fat content changed.. I will make a note in the recipe. Thanks so much for your note! I think you should edit this to state coconut cream should be the only ingredient. Most canned coconut creams have guar gum or other stuff. Hard to find just plain coconut cream. As a result, this was a disaster. Center filling froze like ice milk. Not creamy or whipped at all. I am so sorry it didn’t turn out. It is ok if the coconut cream has guar gum as long as the fat content is high. I have a note at the end of the instructions stating that the fat content must be high and a link to a sample coconut cream can that has high fat content. I hope you get to try it again bc these bars are truly sensational. Sorry it didn’t turn out and thanks for stopping by. 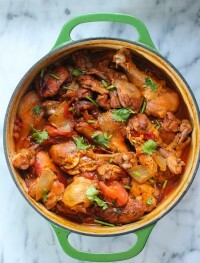 I’ve just tried to make this and the centre is still runny after an hour in the freezer. :( The coconut cream used is 21% fat. I’ve just seen that the coconut cream you’re using has guar gum added which is a thickening agent. I’m guessing this is the reason a few of us are having issues as not all coconut cream has stabilisers added. 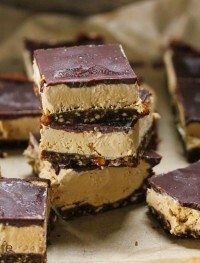 I made these tonight…using cashews and dried cherries for the bottom layer. I used the TJ coconut cream and added a tablespoon of unsweetened cocoa instead of coffee. Wow. These are good. I thought I would address some of the concerns I have read in the comments. First, the 9% fat coconut cream from Trader Joe’s in the ice cream filling will create a thick liquid (like heavy cream) when you pour it into the pan over the crust. Before you add the topping, this layer needs to freeze. It could take a few hours for the coconut cream to freeze. When it is frozen, you can add the chocolate topping. 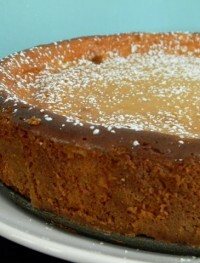 You have to work quickly at this point since the topping can freeze on the cream and become brittle. I cut the bars while they were still in the pan and before the chocolate topping got too hard. Then I put them back in the freezer. The coconut cream layer does get hard and a bit icy, but if you let the treat thaw for 5 minutes before you serve, it is surprisingly creamy. Thanks so much for your awesome recommendations. These will help a lot of the people making the bars going forward. I am glad you liked the bars. Thanks for stopping by.